Shouldered strombina Strombina angularis, copyright Atoll Shells. Contains: Liratilia, Zemitrella, Columbella, Pyrene, Costoanachis, Anachis, Mitrella, Amphissa, Aesopus, Astyris. The Columbellidae, dove shells, are a group of small to medium-sized, active marine gastropods including both carnivorous and herbivorous species. The family is divided between two subfamilies: Atiliinae tend to have narrow fusiform shells, and have a radula with sigmoid lateral teeth and a narrow median tooth, whereas Columbellinae tend to have coniform or strombiform shells, and have a radula with broad and flat lateral teeth and a broader median tooth (Radwin 1977). 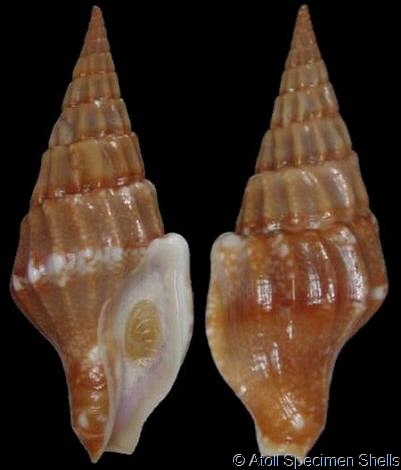 Within the Atiliinae, Strombina is a genus of large (up to 40 mm) columbellids with shouldered whorls found in the eastern Pacific and western Atlantic, though it survives as only a single species in the latter region (Radwin 1978). Characters (from Seashells of NSW): Siphonal canal very short, often little more than a gap at anterior end of aperture. Top of outer lip with sinus present, usually shallow; denticles usually present inside outer lip, occasionally just a single indistinct bulge. Inner (columellar) lip without plaits, weak denticles often present, aligned on an axial ridge just inside edge of callus. [P01] Petit, R. E. 2001. Book review: Catalogue and bibliography of the marine shell-bearing mollusca of Japan. Type figures. Nautilus 115 (3): 114. [R77] Radwin, G. E. 1977. The family Columbellidae in the western Atlantic. Part IIa.—The Pyreninae. Veliger 20 (2): 119–133. [R78] Radwin, G. E. 1978. The family Columbellidae in the western Atlantic. Part IIb.—The Pyreninae (continued). Veliger 20 (4): 328–344.